Nathan Myhrvold, former chief technology officer at Microsoft and co-founder of Intellectual Ventures, has written with chef Francisco Migoya “Modernist Bread,” a five-volume cookbook chronicling the history and science of bread-making. BELLEVUE — Two years ago in Paris, Nathan Myhrvold wandered the Louvre on a mission, camera in hand, documenting every image of bread he could find. “Sadly, art historians don’t catalog paintings by whether or not there’s bread in them,” he said. So Myhrvold, the former chief technology officer of Microsoft and a founder of the investment firm Intellectual Ventures, built his own catalog. That day, he shot about 100 buns and rolls that peeped from underneath oil-rendered French linens and gleamed in dark Dutch still lifes. 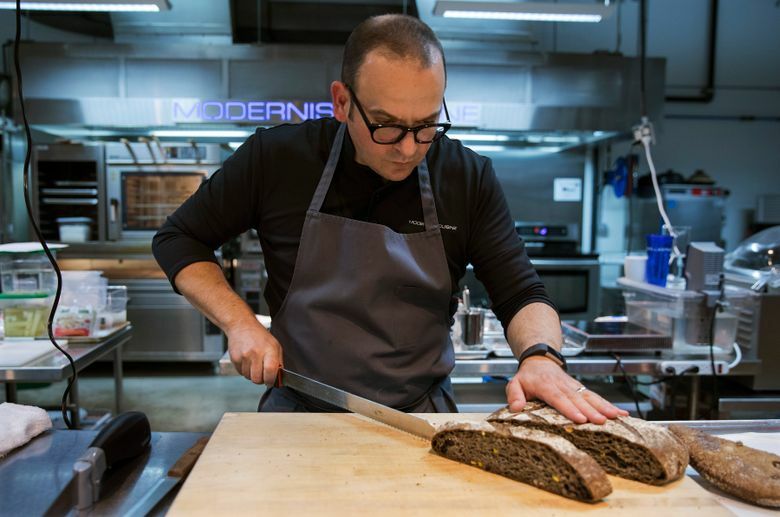 Each one became a data point in his obsessive study of bread and how it’s changed through the ages: “Modernist Bread,” a five-part cookbook to be released Nov. 7 by the Cooking Lab, Myhrvold’s own publishing house. 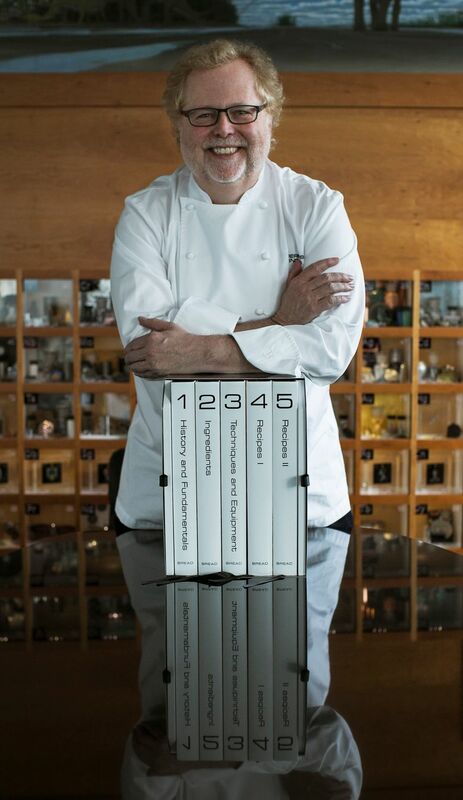 Written with chef Francisco Migoya, the book is a single-subject follow-up to “Modernist Cuisine,” the encyclopedic 2011 boxed-set cookbook that used hard science to demystify culinary techniques, and dazzled cooks with its cross-sectional photographs showing hidden processes inside pressure cookers and charcoal grills. The new book — over 2,000 pages, with step-by-step images and a hefty list price of $625 — chronicles the history and science of bread-making in depth (“Baking is applied microbiology,” one chapter begins), breaking frequently for meticulous, textbook-style tangents on flour and fermentation. Its recipes require a commitment to close reading, and to flipping back through the books for deeper explanations. But each has useful variations that work with many kinds of mixing and cooking methods, for both professional and home kitchens. Above all, the book is a call for cooks to rethink one of the world’s oldest foods — to understand how bread is made, using more than their instinct and intuition, so they can push the craft forward. The Cooking Lab is headquartered in Bellevue. Migoya runs a spotless kitchen on the second floor, equipped with many types of ovens, a freeze dryer, a three-dimensional scanner and an ultrasonic bath. “Modernist Bread” finds inspiration in sources industrial as well as artisanal, offering a defense of high-fructose corn syrup alongside a guide to caring for wild sourdough starters, and debunking the idea that water purity affects bread’s rise and flavor. It offers fresh techniques for solving all sorts of infuriating baking puzzles. 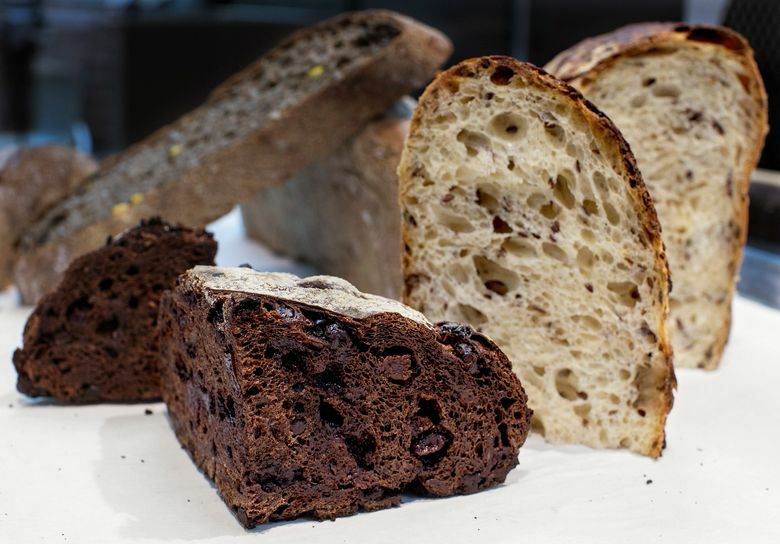 To combat the density and dryness of whole-wheat bread, Migoya adds in the bran and germ later, only after the dough has developed significant gluten, to bake a more lightweight, airy loaf. To prevent the inexorable balding process in which bagels shed their toppings, a fine slurry of modified tapioca starch works as an edible glue, firmly affixing a dense, even layer of toppings to baked bagels. A little gelatin makes high-hydration doughs — those gloopy, fussy darlings of the bread world — much easier to handle, with the bonus of a browner crust. Some of the tips are dead simple: To rescue an over-proofed dough, punch it down and reshape it. As Migoya zipped through the kitchen, past his sketches for a bread sculpture inspired by Giuseppe Arcimboldo paintings, a timer beeped. He reached for a tub of rising dough, a gassy network of bubbles visible under its dark-gray surface. He had folded in a purée of huitlacoche, the rich, earthy fungus that grows in corn, as well as some fresh yellow kernels. Though he had access to more equipment than most fine-dining restaurants on the planet, Migoya followed a hands-on method that relied on plenty of visual and tactile cues. Migoya had mixed the whole-wheat dough with Sir Yeast a Lot, one of two 4-year-old sourdough starters that are fed daily, so they’re up and ready to work by 10 each morning. Every half-hour, he gave it a quick fold, until he could stretch the dough into a membrane as sheer and ephemeral as a chewing-gum bubble. When Migoya lifted the lid on the wobbly sourdough, to add bran and germ, an ancient smell wafted out: fermented grain, rich with perfume, high and sweet and alcoholic. Migoya, 43, was born and raised in Mexico City, where piles of huitlacoche filled the markets during the rainy season. He worked as a pastry chef at the French Laundry, and later as a teacher at the Culinary Institute of America, and wrote several cookbooks as well as the Quenelle, an early food blog with a cult following in the restaurant industry. He once spent seven years, off and on, improving on his recipe for pâte à choux. He was running his own chocolate shop in the Hudson Valley when Myhrvold, now 58, tapped him to head up the Cooking Lab’s kitchen in 2014. One mystery eluded Migoya as he worked on the book: understanding the specific, glorious smell of just-baked bread. Early in the book’s genesis, Migoya worked for months on a bread family tree — lean, enriched, flat, bricklike — tracing relationships in ratios and practices across the world, narrowing categories and setting down definitions for words that have often resisted them. After Migoya baked his huitlacoche sourdough, it had a dark, crackling crust. Sawing it open with a serrated cake knife, he revealed a tender, stretchy core, a gelatinous sheen along its wide, open crumb. “It’s beautiful,” Migoya said, as if he hadn’t cut into thousands of similarly beautiful loaves. He had been tinkering with a huitlacoche bread for some time. For this version, the one he planned to serve on a publicity tour for the book, Migoya had charred chilies and slow-cooked a traditional red mole from Puebla, Mexico. He mixed it with butter in a Pacojet, which sent a high-speed blade spinning through, top to bottom, turning it smooth, shiny and just the right temperature to eat. He used a piping bag fitted with a flat tip to squeeze a generous amount of butter down the middle of each slice, sweeping crumbs away, keeping his cutting board pristine. The bread was the deep gray of wet pavement, and the crimped ribbon of mole butter was bright red. It had an intense, satisfying crunch and chew, and an elaborate rush of heat and tang that carried on long after the last bite. It was familiar, but also entirely new. 1. In a wide mixing bowl, whisk together the yeast and water and allow the yeast to bloom, about 1 minute. Whisk the sourdough starter into the mixture until dissolved, then add the flour, cocoa powder and coffee. Use a dough scraper to stir the ingredients into a shaggy mass. Cover with plastic wrap and set aside for 20 minutes, then add the salt, incorporating it well. Transfer to a lightly oiled plastic container and cover with plastic wrap; it will be sticky. 2. Rest dough for 30 minutes, then lightly oil hands to fold: Pull one edge of the dough up and press it down into the center of the ball; repeat with the three other edges of the dough, then cover dough. In 30 minutes, repeat the folding, this time incorporating the chocolate chips and cherries. Repeat the folding every half-hour, for a total of six folds. Check for gluten development: Pinch a piece of dough between your fingers and stretch it. It should stretch out to a thin, transparent membrane before tearing. If not, repeat folding and check again. 3. Turn the bread out onto a lightly floured surface and use hands to gently tuck the edges up toward the center of the dough, then flip the dough over so it’s seam-side down, and gently round with your hands. Cover with plastic wrap and rest dough for 20 minutes, then tuck edges down toward the seam, to shape dough into a tighter ball. Cover with plastic wrap and rest for 10 minutes. Transfer to a flour-dusted wicker breadbasket, seam side up, pinching the seam shut if necessary. Wrap basket with plastic wrap, or slide the basket into a clean plastic bag, closing it. Proof at about 55 degrees, or in the refrigerator, for 14 to 16 hours, until dough has increased in size and springs back slightly to the touch. 4. When you’re ready to bake, remove the dough from the refrigerator and transfer it, smooth side up, to a large cast-iron pot (with a lid) lined with a round of parchment paper. Be careful not to over-handle dough and lose air bubbles. Cover and bring to room temperature for one to two hours. Position a baking rack in the center of the oven and heat to 500 degrees. Using a razor or fine, sharp knife blade, score a cross on the top of dough, making a fast, clean cut about 1/8- to ¼ -inch deep. 5. Bake covered for 33 minutes. Remove lid and bake for an additional 10 minutes, cracking open the oven door for the last five minutes. Push a thermometer into the bread dough; it should read 195 to 200 degrees for cooked bread. Transfer bread to a cooling rack, carefully remove the paper, and allow to cool completely at room temperature before cutting open.